Just days after Bill Mastro's guilty plea, it looks like another hobby criminal matter might also soon be resolved. Sentencing begins tomorrow for several dealers who plead guilty to selling fraudulent sports memorabilia, including pieces to card companies. The first two defendants that will be sentenced are Brad Wells and Steven Jensen. Bradley Horne and Bernard Gernay are set to be sentenced later this month. Prior to the sentencing, Wells, Horne and Gernay's attorneys filed sentencing memoranda with the court. Legal translation: Each defendant filed separate documents that outline why their sentences should be as light as possible. These documents contain character references, letters from friends and legal analyses designed to persuade the judge to take as much pity as possible on Wells, Horne and Gernay. 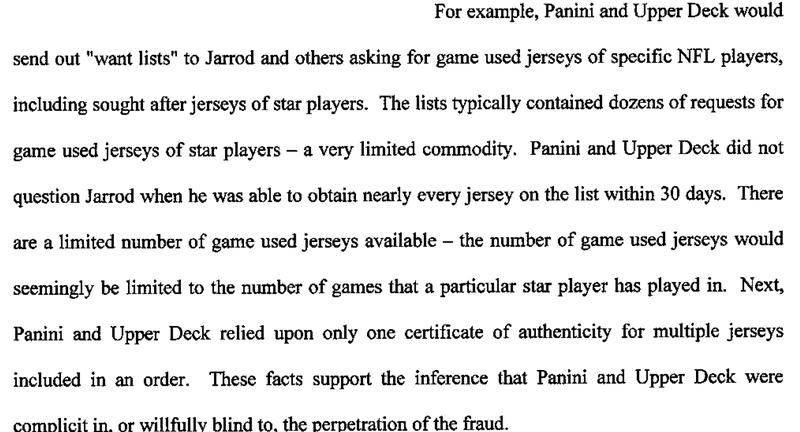 Of interest to the trading card industry, the memos also touch upon the alleged dollar value of fraudulent jerseys sold to trading card companies. To date, the details of Jerseygate have been relatively scarce, mostly because the large majority of documents from these cases were filed under seal. The only insight into the meat of these cases was provided by the release of an FBI interview from the 2009 National Sports Convention with Brad Wells that shed some light on how allegedly game-used merchandise and memorabilia were sold -- quite a bit to trading card companies. Through the sentencing memoranda, we now have a little more insight. For example, one factor the judge will consider in determining each defendant's sentence is how much "restitution" needs to be provided to the victims. One of the victims appears to be Panini, which prepared "victim impact statements" that explain how much Panini was allegedly harmed due to its purchase of alleged fraudulent game-used memorabilia. The amount of "restitution" that Panini should be afforded was discussed in great detail by both Wells and Horne. According to Wells' October 9 memo, Panini contends that due to Wells' conduct, it incurred a loss of $3.3 million. Wells contends this is figure is "not legally or factually sound" because 1) Panini merely acquired $125,000 in merchandise from its predecessor Donruss that Donruss, not Panini, paid for and 2) the "merchandise supplied by Mr. Wells" was actually sold by Panini for a "huge profit," therefore Panini "had no loss" and ordering restitution would make Panini "well more than whole." Specifics weren't given so we still don't know which sets or memorabilia cards might be impacted. Following Wells' math, it looks like Panini claims an out of pocket loss of $125,908 (which is the value of merchandise acquired from Donruss) and a loss of $114,745 which is the value of materials quarantined by FBI. Panini contends this equates to lost revenue of $2.7 million (which Wells' attorney notes would be "a profit margin of 23.5 times the cost of the merchandise."). I agree with Wells' attorney that including "lost profits" as "restitution" is a reach. In fact, Wells' attorney analogized the situation nicely to a pawn shop that purchased a counterfeit gold Rolex for $500, and, after having it seized, sought a loss of $7,500 for a potential sale had the watch been authentic. Restitution of Panini is also a topic in Horne's October 11 memo. Apparently, Panini contends Horne is responsible for a $1.3 million loss. Horne contends this is a highly inflated figure for reasons similar to those given by Wells, but he also argues Panini's figure is incorrect because it is generated from all of his sales to Panini from 2009 through 2011, which totaled $834,011. However, as reflected in a government spreadsheet "only $164,810" of merchandise sold to Panini by Mr. Horne was counterfeit – the "vast majority" of the other items were authentic. Anyone else want to see that spreadsheet? As Mr. Wells even advised the agents in his interview referenced above, certainly the card companies – who were underpaying for what the value of the items would have been if they indeed were legitimate game used jerseys – either knew or should have known of the foul nature of the items. We are not seeking to cast aspersions on any particular "victim", but counsel thought to indicate that the term "quasi-victim" or "willful blindness" may be more apt, and restitution in the circumstances would not be appropriate either financially or equitably. Legal suggestion: Wells, quick, file a trademark on QUASI-VICTIM! It could be a great name for a card set of nothing but fraudulent game-used pieces. On October 11, another defendant Jarrod Oldridge submitted a sentencing memo which goes into additional detail about his alleged dealings with Upper Deck and Donruss. The following paragraph and footnote, speak for themselves. Oldridge also discussed “want lists” from trading card companies and trading card companies’ alleged reliance on a single certificate of authenticity for a batch of jerseys to support inferences that trading card companies were complicit in or willfully blind to the allegations. By the end of the month, a large portion of the criminal side of Jerseygate will also end. We still have yet to see if a civil litigation side of Jerseygate will arise. And, unfortunately, it appears that a lot of what happened might forever be a mystery. But again, anyone else want to see that government spreadsheet? So this is a long shot… how does this affect the collectors holding these fake basically useless cards? Is there going to be restitution for us? Mark � At this point, since none of the companies have come forward, it’s tough to know what sets/cards are impacted. Ideally, that’ll change and we can at least know. It’s pretty frustrating as a consumer to see Panini fighting for money that should rightfully be returned to those who bought products that Panini represented as authentic which were not.